Katharine Hayhoe is a climate scientist at Texas Tech. 2017 has proven to be a rough year for climate scientists. The turnout at the People's Climate March in DC in April this year definitely illustrated that! The series, produced in coordination with her local PBS station & as part of the PBS Digital Studios, first aired Sept. 28, 2016. They are released every-other-Wednesday. Checking out Katharine's bio, you'll see that she's quite involved with a lot of projects and committees! You can also follow her blog on her website too. It was on her Facebook page where I learned of the "Global Weirding" episode that she shares with those she knows who are "anti-climate change." She shares that the facts & science alone won't serve your goal since those people counter the idea view it as an innate part of "who they are." Hmmm... I'd guess that serves for other political beliefs as well, which also sounds a little bit like dogmatic American politics this year! Need even more climate science to feed your soul? Here's Katharine Hayhoe's TEDx Talk from 2015. Of course, it was 2 years ago... and the warming data over the last 2 years has indicated that 2016 was the warmest year on record. And 2017 is tracking the same way. So it is still very relevant. In it, she details the fact that climate scientists have found 26,500 indicators around the world of planetary warming. Additionally, Texas has "enough solar potential to power the entire world two times over." Just think of what we all could do! 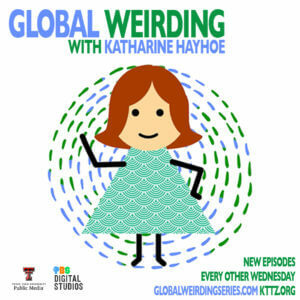 To check out or subscribe to Global Weirding, go to globalweirdingseries.com which will take you to her YouTube channel. She's working away on Season 2 of Global Weirding, so stay tuned for new episodes to air every-other-Wednesday starting this September. Jack Black's "Earth To America"
A 4Ocean Bracelet 4 Me!